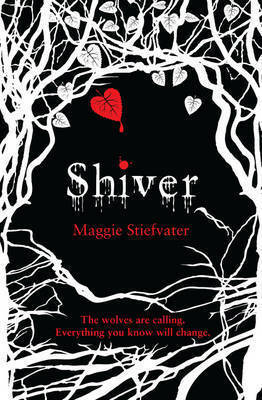 But before Christmas I (luckily) gave in and bought both "Shiver" and "Linger", the sequel. I got them at a really good price (secondhand) and thought that if I like "Shiver", I would be glad to have "Linger" lingering around. This turned out to be a wise decision because even though "Shiver" is all about wolves (a subject that I have been off ever since "Twilight"), it is actually a really good YA book. The story goes like this. Grace Brisbane is living in a little Minnesota town with her parents who are always absent. Even when they are home (rarely), they are emotionally absent and it falls to Grace to take care of things such as cooking dinner and making sure she does her own homework. They have no idea what happens in her life and that is probably good because Grace is honestly quite a strange girl. She is a bit of a loner who has only two friends at school and in the winter time she spends all of her free hours looking at the wolves at the edge of the forest. When she was a little girl, she was attacked and almost killed by them and ever since then, they have held a special place in her heart. Strangely, you might say. One of them, a wolf with beautiful almost human eyes, she almost sees as a friend and she dreams of following him into the woods. Obviously (if you ask me) it turns out that the wolf is really a werewolf - or at least it is a boy, Sam, who during the winter is caught in the body of a wolf. When Grace saves his life after he is shot, it is love at first sight. And trouble at first kiss. And so begins the trilogy of The Wolves of Mercy Falls. 1) Grace is easy to sympathize with. As a main character she is quite good. 2) It has a lot humor and I love that about it! So many YA books are too busy being just serious or just fun. This one hits all the right notes when it comes to balancing humor and seriousness. 4) Grace's parents really caught my interest and had me angered. They are so uncaring and it makes for an interesting side-story. 5) Some of the minor characters are really fantastic. My particular favourite is Isabel! 6) The poetry of Rainer Maria Rilke features. If you haven't read anything by Rilke, you need to do so asap. Off to Amazon you go. 1) Grace is rather boring... She has no real interests apart from wolves and maths and she is not a really very good friend. She is a leeettle beet socially akward. 2) Sam. A little bit whiny at times. Would like him more man and less... boy. 3) Olivia. As minor character goes, she is a pretty annoying one. She should either have been left out or had been given more personality. She ends up a bit cardboard-ish. 4) Sam's poetry is too much for me. Skipped it all, it was just too too much. Read it if: You love paranormal romance. You always hurry straight to the wolves when you visit the local zoo. You like a good comfort-read with no big surprises but lots of little ones. I wasn't a big fan of this book at all - too predictable and the characters fell flat too. I agree that the humor was there, but...that was it. :( That's too bad! Oh well.